I’ve talked to hundreds of business owners. What I’ve discovered is that many who’ve freed themselves to work on high-level tasks in their businesses often engage in marketing. 1. That marketing should be considered a high-level task. 2. That marketing is worth putting your time into. 3. That marketing can be a lot of fun. Marketing is a skill you should master, and if you can’t, you should find a marketing expert who can help you grow your business. Either way, it’s beneficial to understand the basics of marketing. Here’s what you should know. Both types of marketing are important. As you can guess, online marketing refers to anything you do on the internet — blog posts, social media, emails, pay per click advertising, Search Engine Optimization (SEO) and more. Meanwhile, offline marketing represents any marketing you conduct that isn’t tied to the internet — networking, speaking engagements, print advertising, publications, trade shows and more. It’s exciting to think about everything you could be doing out there. But I think you’ll find it valuable to pick your battles, especially early on. What I mean is that novice marketers tend to spread themselves entirely too thin. Social networks? Cool — I’m going to go register 50 accounts right now! Don’t be unrealistic. If you’re just getting started, there’s only one of you. You can’t keep 50 separate social media accounts updated (at least not without the help of automation tools). If I were you, I would focus on mastering one or two channels before adding more. This will help you stay focused and not take on more than you can handle. But how do you know where you should put your time and energy? That’s what I’m going to get into now. The great thing about being a creative entrepreneur is that you should be able to come up with unique and disruptive ways of getting in front of your audience. But a metal band performing at a country venue might cause a riot, so we still need to be smart and mindful about how we market ourselves if we don’t want to waste our time, money and energy. There’s a social network called XING. Have you heard of it? It’s essentially the LinkedIn for creatives. You might be able to connect with a few people and make some fans by sharing your art on XING. I’m not going to discourage you from trying. But I can’t imagine it would be the best investment of your time. So, whether it’s online or off, it’s important to go where your audience is and have a chance of connecting with them. The good news is that there are publications, communities, Meetup groups, forums, blogs, social networks, storefronts and eCommerce stores, and other businesses and organizations serving virtually every audience out there. There’s a good chance someone has already built the audience you’re trying to get in front of. Now, you might not like the idea of competition. I understand. But the fact that there are other people in the market you’re looking to enter is usually a good sign. It means there’s an opportunity to be had. Someone is making money in the niche, and you could be too. And, as I’ve already pointed out, there’s probably an opportunity for you to get in front of that audience. In an online setting, that might mean guest posting on a popular industry blog. Offline, that might mean getting booked at a venue where people appreciate your style of poetry. Ultimately, I don’t care what mediums or channels you use to market your art. So long as it’s helping you get the results you want, and it’s not violating man or God’s laws, it’s all fair game. But you should still build your own platform, regardless of what other platforms you leverage. Nevertheless, it’s good to be aware that you can create visibility on third-party platforms and redirect traffic to your own. But hold the phone. If you don’t know who your audience is, you wouldn’t know where to begin. Don’t worry — that’s what the next section is about. Okay, so you’ve made something — a poem, a play, a painting, a drawing, a song, anything — and now you want to share it with the world. You post it to your blog and… crickets. So, you wait a while. You’re sure those comments, emails and/or purchases will come flooding in once everyone sees your brilliance. A week later… still nothing. Well, there are plenty of reasons why this can happen. It could be that your creation isn’t as good as you thought it was. It could be that your offer isn’t priced appropriately. More than likely, it’s just that you don’t have enough traffic coming to your blog. Fortunately, it can grow over time if you keep with it. But to get traffic coming to your website, you first need to identify your audience and understand what they like. I’m not suggesting that you must adjust your art to suit your audience. Sometimes this is necessary but there is an audience for practically everything out there already. Very simply, to appeal to them, you need to gain a better understanding of who they are. One way to do this is to find artists who are already doing the kinds of things you’re doing. You can then analyze the content they have on their website, look at the comments on their blog, or just examine their art for more ideas. You could also enter their website address into a tool like Alexa or SimilarWeb and get a better sense of who their audience is. These tools will give you information on things like audience geography, top keywords the website ranks for, traffic sources, audience interests and more. Don’t forget to take advantage of Google Analytics for your website and Insights on Facebook. It’s a bit technical, but there’s a lot you can learn about your audience by analyzing the data you collect. Keep growing your traffic on your website and likes on Facebook, and you’ll learn a lot about your audience. Sometimes this is a fast process and sometimes it can take a lot of time. Either way, identifying your audience is worth the effort so stick with it! 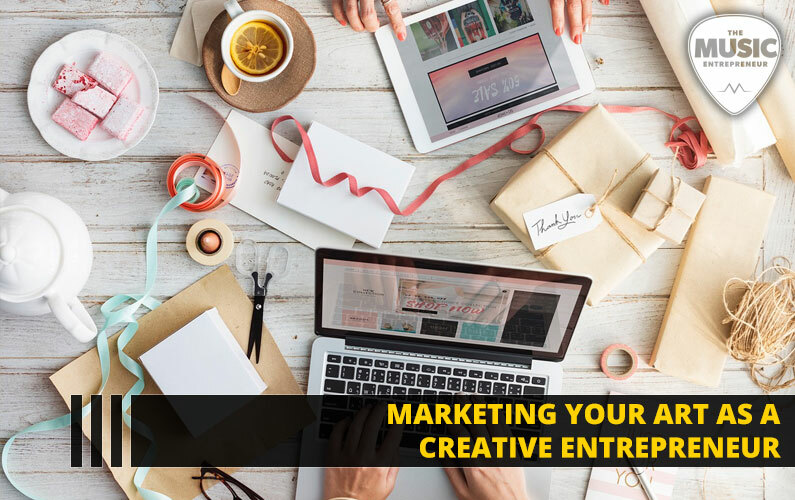 If you can market your art effectively, you can find success as a creative entrepreneur. That’s what I believe, anyway. There’s a lot that goes into marketing. So, don’t be afraid to delve deeper into this world. You might end up spending a lot of time in research and study, but I promise the effort you put in won’t go to waste. Most of all, keep it simple, especially early on. The more complicated the strategy, the harder it can be to execute because it will require more of your time, effort and money. And, there’s a greater chance you’ll make mistakes along the way. I would suggest creating a simple written plan to begin with. You can always adjust as necessary, especially if you find it’s not working, or you know it could be improved upon.